With every company seemingly coming out with some version of a neutral eyeshadow palette, it can be quite overwhelming when trying to decide which one is right for you. 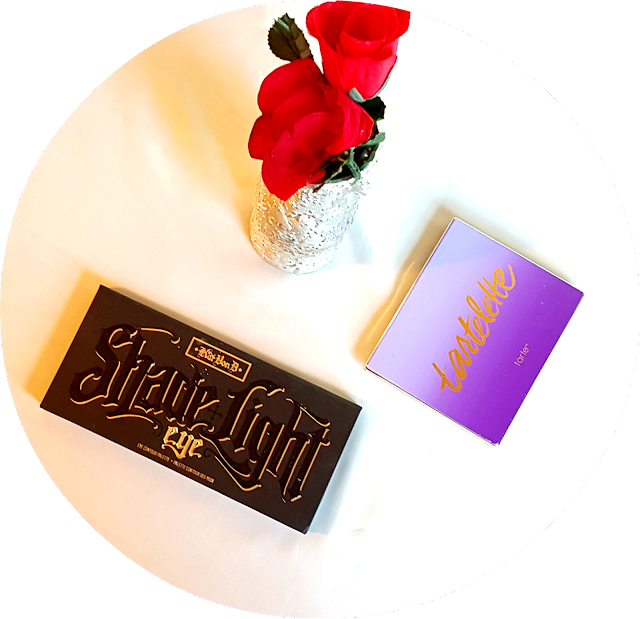 To narrow things down, I have decided to pit two of the most popular matte neutral eyeshadow palettes out there against each other--the Kat Von D Shade + Light Eye Contour Palette and the Tarte Tartelette Palette. Now you might be wondering why you would need a palette full of matte shades. Well all-matte eyeshadow palettes are especially useful because not only can you create looks just using the palette alone, but they can serve as great companions to ground more shimmery looks. Their diversity lies in the wide variety of shadows, ranging from highlights to transitions and defining shades, everything you could possibly need to create a well put together look. At first glance, these two palettes are extremely different in outer appearance. The palette by KVD is a bit bulkier and is made of basic black cardboard, whereas the Tarte palette has very appealing plastic gold and purple packaging. Both palettes also come equipped with relatively large mirrors. The Shade + Light palette mirror is not full sized nor is it able to stay up on its own, however, it is still a pretty big mirror. The Tartelette palette, on the other hand, spans the full size of the palette and can stay up on its own, which makes it extremely convenient if you're doing your makeup on the go. Also, it is important to note that both have secure closures, making them travel-friendly. While the Shade + Light palette has a magnetic closure, the Tartelette palette has a clasp closure. Now if you think the two palettes are polar opposites in packaging, the differences only continue to accumulate when comparing the shades inside. Both palettes contain 12 matte shades, but that is about as far as the similarities go between these two. Shade + Light has more neutral to warm shades, whereas the Tartelette palette is very cool-toned. After swatching both palettes, I found that I enjoyed the texture of the Tarte eyeshadows more. They were more smooth and pigmented and easier to build up than the Kat Von D eyeshadows. For those of you concerned with the value you're getting for your buck, you get 16.8 grams of product for $46 with KVD and 18 grams of product for $45 with Tarte. Though there is only a slight difference, it is undeniable that the Tartelette palette is a better value. Personally, I find myself reaching for warmer shades more frequently with my makeup looks, so it is all about personal preferences and what you would actually use on an everyday basis when choosing between the two. Either way, you can't go wrong choosing one or the other as they are both great palettes to have in your arsenal.